Hi crafty peeps! It's my turn to share a project featuring a fun Sparkle Blend from the awesome Sparkle Blend company Doodles Paper Playground! A little spring butterfly chasing action to hopefully spur on warmer weather! The Sparkle Blend I used is called Cafe Au Lait. A beautiful blend of buttery cream colors, tan, light brown and ecru, you simply can’t go wrong adding this blend to your trendy Coffee themed projects. Stop by the Sparkle Blend Fan Club on Facebook to share your projects and to see what others are making or drop in on the Instagram account to keep up with what's new! Doodles Paper Playground Blog Hop! Hello Sparkle Blends Fans! Its time for the Doodles Paper Playground, April Sparkle Blends Release Blog Hop!! We’ve got 6 beautiful spring-y blends to share with you this month: Easter Basket, Springtime, Sunshine, Cafe Au Lait, Birthstone Collection: April - Diamond, & Birthstone Collection: May - Emerald. If you love soft, pastel shades, and budding greens, you're definitely going to love this release! This month there are beautiful new blends for you to choose from--or even better, order them all! Do you have a favorite? Make sure you circle back to the Doodles Paper Playground post after the hop, and comment on that post with your favorite blend from the April Release, for a chance to win a package of that blend! Carolyn Labille ... Your are here! Hello Sparkle Blends Fans! Its time for my make for Doodles Paper Playground! I made a little cheerful sentiment card to share this week. I am using a new Sparkle Blend for this fun little card. It is called Sunshine and it is bright, cheerful and full of super fun shapes and beads. I love the micro mini beads but there is so many cute shapes in the blend. I like them all! The sunshine blend is a bright, cheerful blend of lemony yellows, chartreuse, white and transparent, iridescent butter shades—you’ll want to use this blend on all of your happiest projects. As always, the Sparkle Blends are only available at White Rose Crafts LLC. Stop by the Sparkle Blend Fan Page on Facebook or stop by Instagram to see what is happening. Happy Crafting! Hi ya crafty peeps! Today I am sharing a shaker card "Girls Rule" I created for Doodles Paper Playground! The super awesome blend I used is called Easter Basket. You can only find these blends at White Rose Crafts LLC. This blend is teeming with little white bunny heads, pastel sequins in a wide variety of sizes and finishes, shaped confetti, teeny flower sequins, and a sprinkling of large pastel, iridescent, plaid paillettes, this blend screams Easter and Spring. He is a peek before I added my sentiment. Don't forget to stop by the Sparkle Blend Fan Club on FB to see what everyone is making and to share your creations! Good morning DRU fans, today I am excited to show you my project that is all about layers and simplicity. I wanted to make a sort of frame that mimics frost and the last days of winter. This card is what I call a frame card. Winter inspired, I wanted to egg on Spring a little bit! I roughed up the edges to give the idea of ice and winter in feel. I am SO ready for Spring. Here is how I created this fun card. 1. Choose your die, stamp and colors and paper. I used the stamp Scooter Tilda and the die Frostyville Border. 2. Cut out several borders in the chosen colors with the cutting device of choice. 3. Take your paper and cut out 2 wavy backgrounds to look like hills and paste them onto card base layer. 4. This is what that should roughly look like. Be creative! 5. Color in your stamp with your choice of markers ect. 6. Take your die cuts and make a border around the image. It's fine if you have to trim and tweak a bit to make it work. 7. For added texture and to give an "ice" feel to the care, I roughed up the edges so the blue would show up better. Good morning DRU fans, today is my first day as a design member and I am excited to show you my first project that is all about layers. 1. Choose your dies, colors and paper. I used the die Honeyblossom Sprig. 2. Cut out several sprigs in the chosen colors with the cutting device of choice. I used green and wanted the flowers yellow. 3. Take your flower color, cut out the heads and paste them onto the green back layer. Use any glue. 5. For added visual interest, I added some pale colors to the flowers then used white and black ink to draw a line and dot pattern on said flowers. 6. To personalize, use a sentiment stamp and adhere. Hi ya crafty peeps! Today I am sharing a CAS Shaker card I created for Doodles Paper Playground! The super awesome blend I used is called Springtime and I LOVE IT!! So pretty with a lot of great soft colors. You can only find these blends at White Rose Crafts LLC. The colors included are mint, yellow, green, gold and turquoise. They are almost pastel in shade but still vibrant enough to dress up any project. Don't forget to stop by the Sparkle Blend Fan Club on FB to see what everyone is making and to share your creations! 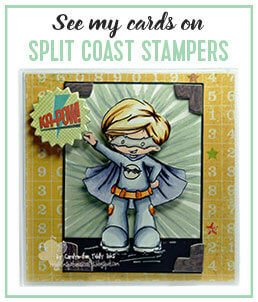 Hi ya crafty peeps, today is my turn to share a LO with you using a Digi set from Buncha Scraps!. This set is called 2 Cool 4 School. This set is brimming with all the goodies and is easy to work with. There are endless possibilities for great layouts! Buncha Scraps has lots of fun goodies in the store for your next digital project. Stop by the Facebook Fan page to share your work and to see what others are creating. Hi crafty peeps! It's my turn to share a little girl power card featuring a fun Sparkle Blend from the awesome Sparkle Blend company Doodles Paper Playground! So I am a girl that likes sparkle, flowers and a strong sense of self so I couldn't help but make this card all about the sense of "Girl Power". Ladies can be the Queen of a castle, a knight that saves the day or a maiden who is assertive. The Sparkle Blend I used is called Flower Power and it's full of fun items! If you are a floral fanatic, this blend is perfect! We skipped the usual cupped sequins in favor of nothing but flowers in this bright, happy blend! Use them mixed as filler for shaker cards, or pick out just a few to embellish your spring and summer projects. Flower styles range from simple daisies to Fimo slices and holographic blooms. Stop by the Sparkle Blend Fan Club on Facebook to share your projects and to see what others are making! Hi ya crafty peeps! Today it's my turn to share a project featuring one of the many cool Sparkle Blends that are available NOW from Doodles Paper Playground. This blend is perfect for those of you who love green, purple and gold! The fun blend is called Mardi Gras Parade and this blend is perfect combination of colors. This blend is a bright, joyous combination of purple, green and gold sequins in finishes ranging from matte to holographic, speckled with stars, golden confetti and sliced Fimo feathers in coordinating shades. What more could you ask for? Head over to the FB group or stop by the Instagram page for more inspiration or share your project in the Sparkle Blends Fan Club on FB group.